New Broadcasting House on Oxford Road was the location of the BBC headquarters for the North-West of England from inauguration on 18 June 1976 until it was demolished during the final months of 2012. Today a small part of the entrance wall still remains, and the road it once straddled is lined with bollards bearing the BBC logo in place of the standard Manchester bee. 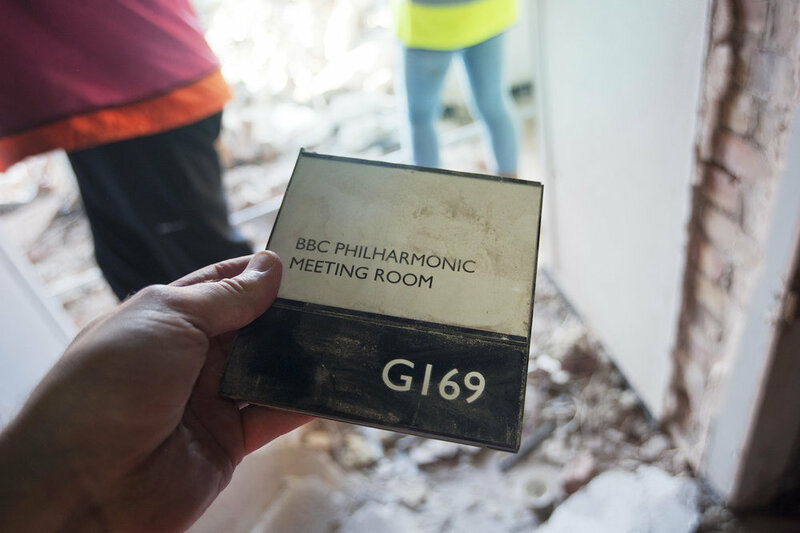 During the demolition we were given access along with photographer, digital artist and film-maker Andrew Brooks, and together we explored inside the shell of the building that remained, including the stripped back husk of the Philharmonic Studio. 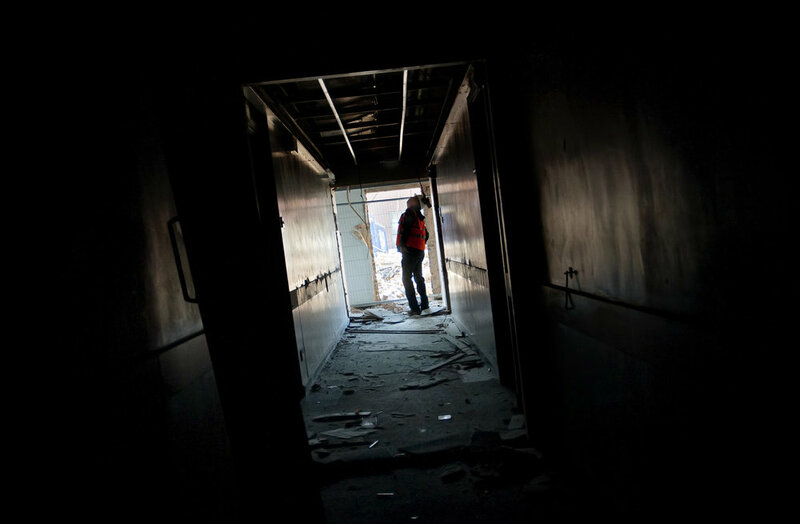 At roughly the same point in the demolition illustrator Michael Morrell was also keeping an eye on the site; spending three weeks observing the initial stages and documenting not only changes to the physical form but looking as well at the human element - the interactions of the crew who were tasked with razing the site to the ground. During our visit the the demolition continued around us, and in the hallways open doors led no longer to studios or offices, but back out to the demolition zone outside. Few elements of the building remained intact except for the Philharmonic studio; now a still, desolate cavern stripped bare of its fittings. In 1956 the BBC bought a four-acre Platt Court site at Rusholme, although Manchester Corporation wanted to use the land for housing. Later, however, it decided that the site was too small and planners suggested that the new headquarters should be nearer to the city centre. "There is too much going out of our cities. The hearts are dying. We must build up interest and get the people in or else the city centres will be going dead on us." The designers had to consider how the Manchester-Altrincham electric line might interfere with transmissions and audio, and allow for the noisy main road traffic on a ste that was bounded by Oxford Road, Charles Street, Pritchard Street, and “the new Mancunian Way”. A main feature of the building’s distinctive appearance would be the use of ‘sooty-greyish’ brick to blend in with the surrounding area. Another example of this camouflaging into the city’s grimy surrounds can be found on King Street - that ugly, black, monolithic building opposite Ship Canal House was also made from Swedish granite coloured black to match its neighbours, not considering that one day those neighbours would be cleaned and restored to their former brilliance. The original BBC plans included a staff restaurant and club which overlooked an open landscaped rooftop garden covering more than 15 acres. The rooftop garden didn’t make it to the final plans, though Manchester these days has one of the highest concentrations of green roofs in the UK, including MMU’s All Saints and new Business School buildings, Whitworth Art Gallery, First Street, Number One New York Street and BDP’s offices at Piccadilly Basin. And not forgetting Manchester Art Gallery’s rooftop beehive. 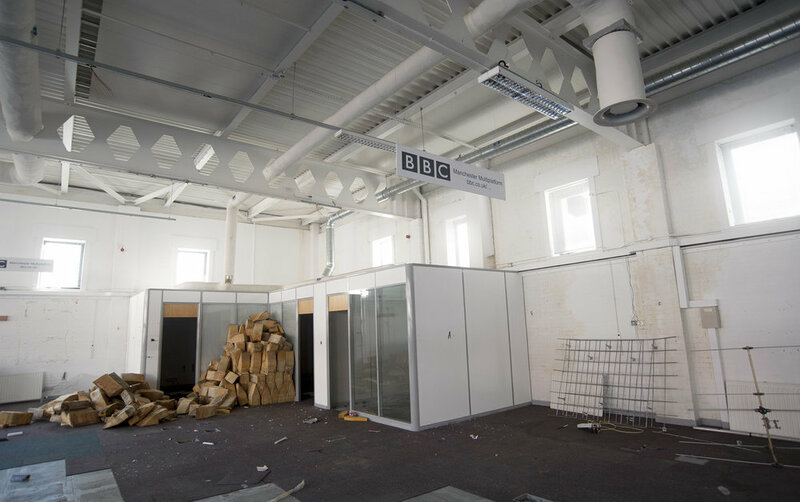 "Britain’s most modern television and radio studios will be housed in the BBC’s new North Regional headquarters to be built on a 4.25-acre site in the centre of Manchester. The heart of the building in Oxford Road will be a 7,000 sq ft television studio - the largest outside London - and a 5000 sq ft music studio. The building is planned to bring together seven make-shift studio buildings and other premises scattered throughout the city. This first main phase is expected to be completed by 1971. Over the years the BBC has resisted pressures for the headquarters to be built outside the city centre. Mr R Stead, the BBC North Regional controller, said the move would attract artists back to the North.” The Guardian, Feb 11th 1966. An inquiry in 1967 stated that the BBC was inefficient in the North through a lack of central headquarters. Manchester Corporation were trying for a compulsory purchase order on their Rusholme site and it was pointed out that the BBC were trying to operate over eight sites around the city and in its suburbs. The television news and sound studios were to be found at Broadcasting House in Piccadilly; the main television studio (and home of Top of the Pops) was in a converted church in Rusholme; a second studio could be be found in another converted church on Plymouth Grove; the light entertainment was at The Playhouse in Hulme (now the NIA Centre which neighbours, and has swapped names with, Hulme Hippodrome), and the orchestral studio was housed in Milton Hall on Deansgate. On August 10 1971 after eighteen years of discussion the plans were finally approved by the city’s planning committee. 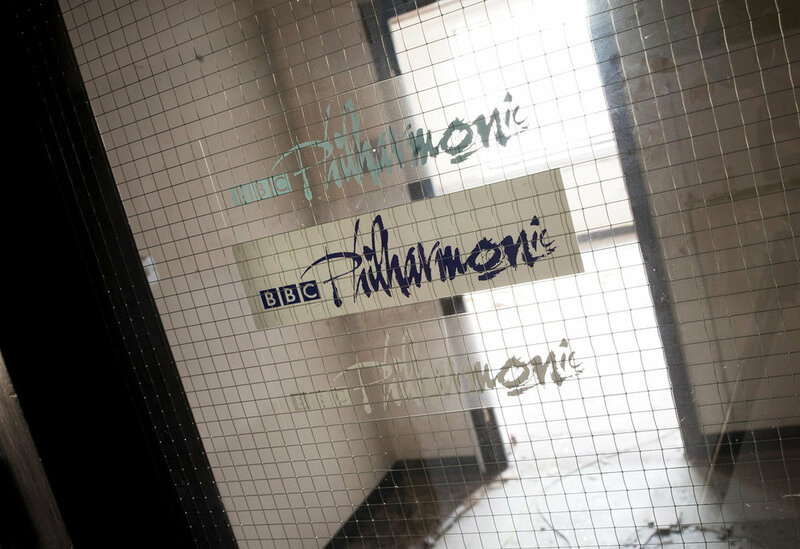 The approved plans were around half the size originally intended, forgoing a music studio and halving the main studio but the BBC stated that they would build in such a way as to allow extensions in the future. Historically the site overlapped the borders of an underground swimming pool owned by Peggy Gaskell. The baths were beneath Imperial Buildings - the location that we now perhaps only think of as home to that rather sinister-seeming cash machine besides Starbucks. There are rumours that the pool, in some form, still exists. "…it is not the world’s cheapest way of mortifying the flesh. But at the end one feels pretty clean in the pores and loose in the joints. It would help still more, one reflects as one emerges into basic Manchester again, to have some genuine Finnish atmosphere in the city to maintain the new hygienic state of one’s pores." 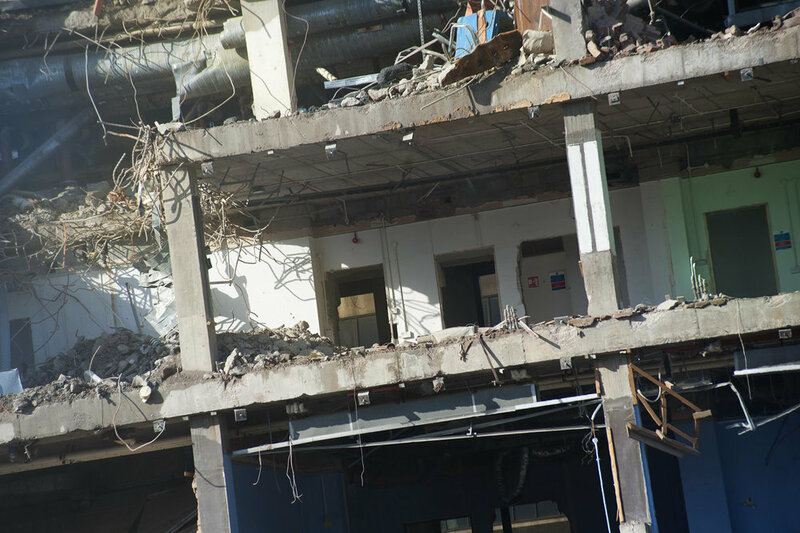 At the time of our visit (a visit approved by the nod of the guard-cockerel at the entrance), the demolition contractors noticed damage in the roof that could have had serious implications to the safety of the building had it remained in-situ. After occupying various premises throughout the city since the 50s the BBC have left Manchester and relocated to MediaCityUK, Salford Quays. In the interim before the Oxford Road site is developed by Realty Estates it will function as a car park. Local bookshop Blackwell’s, wrote an open letter to Realty Estates with the results of a rather amusing poll for what the public would like from the new development, you can read it here (the answer is a giant ball pit), but the plans are for the Bruntwood development Circle Square. To view these photos, and many more from our visit, in high resolution and full screen visit Andrew’s gallery here. Michael Morrell has illustrated a series of three newspapers using reportage illustration to document the social history surrounding the loss of this landmark building. These were sold as part of our Streetview exhibition.